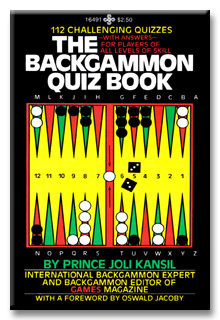 COVER: This fun, easy-to-follow book contains 112 quizzes for all beginning, intermediate and advanced backgammon players. Divided into sectionsfrom the opening game to bearing offthere are eight quizzes to each section and three rolls of the dice for each quiz. Not only will the variety and number of quizzes sharpen your skills, but the fully explained answers will provide you with backgammon strategy you never knew existed. You'll be able to challenge the experts and improve your game at the same time! In addtion, The Backgammon Quiz Book contains a complete set of rules, probability tables, choices for opening rolls and more. QUOTES: "A thoroughly enjoyable and relaxing way to sharpen your game and learn to think as an expert does. "Oswald Jacoby.